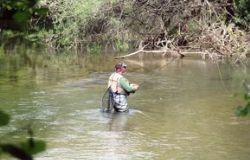 To practise fly fishing, you need to use specific equipment and know how to handle it. This exciting technique, which calls for observation and tactics, is accessible to everyone. Clubs, like the one in Chaumont, can introduce you to fly fishing. They can teach you to cast and to set up flies and rods. They organise fishing expeditions in various regions, and provide an opportunity to meet other enthusiasts in a friendly atmosphere. These clubs are grouped into a national federation and a regional league, and are approved by the Ministry of Youth and Sports and the Ministry of the Environment. There is no review about La Peche À La Mouche Avec Le Club Mouche Chaumont - Haute Marne, be the first to leave one !